Can Disneyland really be better? Our latest trip to Disney World was an amazing vacation--AMAZING. I loved Epcot. And the Wizarding World of Harry Potter was the most magical commercial vacation moment of my life (and did I mention I loved Epcot?). I could easily write about the ways Florida was better than California (warmer beaches, Epcot, Harry Potter, NASA). But when I was on Disney property, I was surprised how much I was missing Disneyland. Could Disneyland really be better? Here are 7 reasons that might make you think twice about which Disney is the best. Just to be clear, this post is comparing both Disney parks in California (Disneyland and Disney California Adventures) against the 4 main parks at Disney World in Florida (Magic Kingdom, Epcot, Animal Kingdom, and Hollywood Studios). #1--The Weather (really this should be reasons 1-3). Except during a heat wave or the hottest two weeks of the summer, Disneyland is cooler with fewer chances of rain showers. I have never used a mister bottle at Disneyland but bought one within an hour of being in Florida. I have never used a poncho in California, but packed them knowing they would be necessary in Florida (and they were). I stopped at a few drinking fountains in California, but I had to circle them like must-do ride attractions on my Florida park maps. And in the most lady like way possible, I would not only drink from the water fountains but I would stick my face in them to cool off. Heat stroke anyone? I am also sure that I have never sweated more than in Florida. As for family pictures, my hair was always in a ponytail and my make-up had long since vanished. #2--The Walking. Disneyland in California is a lot of walking--6-7 miles per day on average. And for a family with young kids, that means pushing around a double stroller for 6-7 miles and carrying a baby while in line. The real shock--Disney World in Florida was DOUBLE that amount. We averaged around 12 miles a day and we were trying to take things easy. I faithfully wore my fitbit to track the steps and miles we walked. I never walked less than 20,000 steps or 10 miles any day of our Disney World vacation regardless of which park we visited. My daughter actually wore out her shoes at the Magic Kingdom and we had to buy a replacement pair just to finish the day. Not only were the rides and attractions spread out more within each park at Disney World, but they were also spread out over 4 parks instead of California's 2. Doing the math, that means my family walked almost 4 times as much during our Disney World vacation (and yes, I got two blisters). I cannot even imagine having the time or energy to hopper around Disney World. The parks are simply too massive. #3--Fantasyland. There is an obvious reason why Disney World invested in a massive expansion of Fantasyland opening throughout 2012. Florida's current Fantasyland is too small. But even with the new attractions (including a second Dumbo ride), Magic Kingdom will still be smaller than Fantasyland and neighboring Toon Town at Disneyland. Add to that the opening of Cars land at Disney's California Adventures, and the gap is only increasing. To make matters worse, Fastpass times are now being enforced in Florida so the Magic Kingdom loses a lot of its magic with long lines for relatively few rides. I think my 4-year-old said it well when he asked where was the Matterhorn, Minnie's house, and Casey's train? #4--Pricing. To some extent, this comes down to where you live. For our family, Disney World is 2-3 times more expensive largely because we have to fly to Florida. Though I consider Harry Potter (which isn't a Disney property) to be well worth it, I do NOT think that Disney World is 2-3 times more amazing than Disneyland. For families that live equidistance from the two coasts, Disneyland should be a cheaper option. When comparing prices, a potential hidden cost is that Disneyland (and California Adventures) can be done in 3 days, whereas Disney World cannot. Families wanting shorter vacations or days to do non-Disney properties will have an easier time in California (such as visiting the beach, Legoland, SeaWorld, Universal, etc.). California also offers a Citypass combining Disneyland with other area attractions at a huge discount. Florida does not offer a similar deal. A shorter vacation can not only save money but can cause less burnout. #5--Planning and Touring. Disneyland requires some planning. For the most popular dining events (such as Blue Bayou or a character dining), a phone call a few days in advance is a good idea, especially during peak seasons. Also, a general touring plan of the park is critical (I have entire blog posts on different touring ideas). But where Disneyland can be planned in a couple of weeks, Disney World requires months of planning--months. A table at the castle can be booked a full six months ahead of time and people do call at midnight to make reservations. In fact, reservations are recommended for a variety of things from baby's first haircut at the Harmony Barber Shop, to Chef Mickey's, to surf lessons at Typhoon Lagoon. With 4 parks, Disney World also requires significant attention to detail when making your touring plans (deciding which rides to do in what order including when to arrive at the parks and when to see shows or collect autographs). Disney World does offer more characters within the parks, so if collecting autographs is important, plans should include a significantly reduced number or rides. Despite trying to take things easy, it is almost impossible not to default into exhaustion level commando style touring at Disney World. The increased size of the parks makes it difficult to move quickly from attraction to attraction and significantly slows the process for acquiring and using fastpasses. I thought I saw a lot of stressed out parents at Disneyland, but the adults at Disney World were far more frazzled. #6--Downtown Disney. This is where less is more. At California, Downtown Disney is adjacent to the parks and can easily be incorporated into the day either as an afternoon break or in the evening. The Lego store is a must as is a take-out order for beignets. Tweens will adore the 365 store which also offers make-overs. 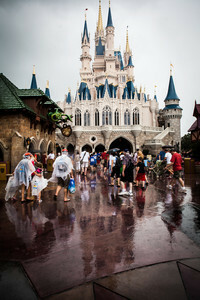 Casual shoppers can easily enjoy a 2 hour shopping trip buying a few odds and ends to complete their Disney experience. It is more like a second Main Street with the magical feel of Disney. (And speaking of magic, only Disneyland offers a magic store on Main Street). Florida is a whole different animal. Florida's Downtown Disney is separate from the parks and practically requires its own day (or at least half a day). Once again it is double the walking of California's version and felt more like a traditional, very large, outdoor mall with a few unique Disney stores. Not nearly as magical, intimate, or fun. Our children tired of it quickly and it was much harder to find the type of stores we wanted. More expensive, more time, less fun. #7--The People. Maybe it was the weather or the week we were there, but I have read others make this same argument. Disneyland is laid-back California style. It hosts fewer crowds and has a less busy, more intimate feel. I found both the staff and other tourists are more friendly and relaxed at Disneyland. Though there were also plenty of friendly people in Florida, I was a little shocked at how poorly adults acted during Star Wars Weekend at Disney World's Hollywood Studios (or among some of the Potter nuts at Universal's Islands of Adventures). Really, both Disney locations are magical experiences. Picking which one is better is like picking your favorite character. And the truth is, you want to visit both because each park has its own unique attractions (did I mention only Disneyland has the Matterhorn or that only Disney World has Epcot?). So which one do we want to do next time--maybe a Disney cruise. This may sound kind of corny, but after having a chance to go to Disney World a few times, we found ourselves back at Disneyland and there is something "magical" about Disneyland. I echo your sentiment that Disney World is very fun and I want to take my kids there someday, but the feeling of the original just can't be beat. I think your dead wrong. First of all, the more walking the better. Disney World must have so much more to enjoy then, if you were walking 12 miles. More for your money. Second of all, our cast members are just as friendly as yours. They may even be friendlier! You can't really brag about your beaches, Umiversal, Seaworld, or Legoland either. We've got all of those plus more. I think Down Town Disney is beautiful by the way. We have more stores, more space, and more magic. And while your 4 year old son may have missed the "Matterhorn". We've got Expedition Everest, which is twice as good. So when it all comes down to it, you can set aside the hot and rainy weather. The long walks are absolutely worth it. Because, we've got more magic and more heart. When you think about it. We've got the whole WORLD while you have only the land. And what's more perfectly magical then being completely surrounded by Disney (unlike California). Oh yeah, and we are better at themeing, have 6 parks, over 300 food options (so don't complaine), and countless rides/ artractions. So, that was my vent. Frankly you have insulted me, being that I have grown up with Disney World all my life. You have insulted Florida as a whole. And do you know what? If you don't like it here, then you don't have to come back. I actually appreciated all the info above. As for the "rant" above I felt like that was incredibly petty and rather immature. All she was doing was telling her experiences...she never said anything that was incredibly terrible about D.W. Your experiences are yours and would have been much better received had you not behaved like a child and threw an adult-sized tantrum. Because of your outburst and lack of self-control, I am choosing to take my children and other family members to D.L. We had intended to go to D.W. but it is clear to me from your reaction that I may actually prefer D.L. Thank you for the 7 reasons as it was very informative and I now have a clear choice. As usual, an Orlando Cast Member acting like a big baby when someone criticizes WDW. That's kind of pathetic but pretty representative of the rudeness with which a lot of CMs treat guests there. I'll take Disneyland Resort and the friendly Anaheim CMs any day. Went to WDW for our honeymoon in September... never again. Disneyland does have that 'magical' feel. WDW didn't have that feeling. Knowing that Walt road the rides with his family in Disneyland and had sayso is incredible. Saying what you want on paper just doesn't cut it. WDW had much more rude crowds. The system of having to leave an hour early from the park to get on the monorail to reach our transportation on time sucked. The cast members were nice, though. I'm glad we went, but the high light was Animal Kingdom. I grew up going to Disneyland; been over 50 times the last 26 years. I prefer walking a few minutes away to the next park and not sweat like I was running a marathon. Disneyland wins for sure and this article hits it pretty spot on. I side more in the middle I think there are things about both parks that have advantages and disadvantages over each other. But I'm sorry the cost is no where close. It is costing us four nights at Disneyland the same amount it is at Disney World for 7 nights, and thats WITH a Cast member discount. Now I'm not talking airfare or anything else, I'm talking hotel stay. I love both parks and just consider them two different parks. Been going to both since I was a little kid. I'm on the east coast so I go to FL more often but I'm been to DW 30+ times and DL 15+ times. Going to DL in 1 day and DW in 150! Can't wait! I grew up on the East coast, but I now live on West coast. I traveled to Anaheim on business and stayed in a Disney hotel. I had no idea I was on Disney property until I passed by a window with a view of the park (several days into my trip). This would never happen in Florida. After watching a video on the WDW transportation bus, my kids said, "Even Walt liked Florida best! " Watch Walt Disney's plan for Epcot part 2 on youtube.